When it comes to personality type, there are a lot of stereotypes that abound, especially in the online community. Some people say that procrastination has nothing to do with type while others say that it has EVERYTHING to do with type. Today let’s take a look at whether your type has any part to play in how likely or unlikely you are to put things off. According to Otto Kroeger, one of the foremost practitioners of psychological type and former president of the Association of Psychological Type, people tend to procrastinate when they’re called upon to use their less-favored mental processes. Let’s take a look at how this can show up in the different personality types. As intuitive-dominant personality types, ENFPs and ENTPs are led by their inspiration and want to pursue original, novel ideas. They want to experiment, theorize, extrapolate, and create. The more they engage with the outer world the more ideas they can envision. They’re excited to brainstorm projects and tasks, and even more excited to start the projects, but when it comes to the detail-work and methodical focus needed to finish the project they tend to get sidetracked. As an example, they might wake up on a Saturday morning anxious to start writing a story that they dreamed of the night before. They open their laptop, begin typing out the first paragraph, and then realize that by writing about space travel they’re reminded of a Netflix documentary they’ve been wanting to watch on Mars. As they’re watching the documentary they look out the window and see that it’s a beautiful sunny day – a day that shouldn’t be wasted. They go outside, call up a friend, and do some hiking while discussing the latest concept that’s sparked their curiosity. As they’re walking they realize that they haven’t had a drink all day. They have to find a drinking fountain or a store to get a bottle of water. On their way there they start talking about life on other planets. They get so absorbed in the conversation that they walk right past two drinking fountains without noticing them. Late at night they arrive back at their apartment to see their laptop open with the first chapter still unfinished. This makes them feel guilty and they convince themselves that they’ll finish it the next day. They also realize that they feel sick and dizzy because they haven’t had enough water to drink. Attending to sensing-details is a struggle for ENFPs. Maintaining a prolonged, steady focus without taking breaks can be mind-numbing for them. Taking care of physical maintenance can also be a struggle – remembering to eat healthy foods, drink enough water, or sleep at the appropriate times. Create a “Vision board” full of creative inspiration and quotes that will help you to stay on track and focus on your goals. Break large projects down into bite-sized pieces so that they don’t feel as daunting. Give yourself rewards for each small step taken towards your goal. For example, let yourself listen to a song you love after each paragraph you write in your research paper. Remember that you’re a “sprinter” more than a marathoner, and that’s okay. You tend to pull out your best work at the last minute. Set reminders on your phone to drink water, eat meals, exercise, or get to bed. Find an accountability buddy to help motivate you to stay on track. Understand that good habits take time to become natural. It takes at least 21 days of repetition for something to become automatic. Just aim for those 21 days, and if you mess up, you can always try again. INFPs and ISFPs can struggle with figuring out the most efficient way to get a project done. They are very focused on living a life that is in line with their personal ethics, values, and ideals, but they can also forget to take tangible action in their pursuit of inner clarity and vision. Coming up with a schedule or a sequential plan to achieve something can be confusing and frustrating to them. It can be hard for them to figure out exactly how much time something will take. Sometimes this means that they struggle to take action because they’re too worried about messing it up or not creating something up to their standards. Delete social media from your devices temporarily if you have an important, urgent task that needs to be done. Find a friend who has a skill for planning (IFPs often mention TJ types are helpful for this). Ask them to help you work out a step-by-step plan for achieving your goal. Make sure that you’re getting enough alone time. It can be easy for you to get sidetracked by the needs and concerns of other people and forget to get to the things that are really important to you. This can mean you lose track of your own personal projects. Getting time alone will help you to sort out what’s really important to you. Find an accountability partner to help keep you motivated. Don’t beat yourself up terribly. Procrastinators have their own special gifts and are often able to come up with creative spur-of-the-moment improvements that non-procrastinators miss. ESFPs and ESTPs have a knack for responding quickly to immediate needs and emergencies. They are naturally spontaneous, flexible, and observant. Because this is their natural mode of operating, they tend to procrastinate about things that take a prolonged focus on only one thing. They like to mix things up, work for a little while then play for a little while, and react to any surprise incoming events that might be enjoyable or exciting. They tend to procrastinate about getting organized because they would rather look at options, generate alternatives, or discover something fresh, new, and stimulating. As sensors, ESTPs would rather stay involved in the moment than plan out future commitments and obligations. They want to feel like they’re getting something done now so they can procrastinate about commitments and decisions that will have a long-term impact. Find a way to pair a mundane task with something enjoyable. Have to do the laundry? Listen to music while you do it! Have to finish a research paper that seems endless? Reward yourself with dinner out when you’re finished! Find a friend to keep you accountable. ESFPs and ESTPs tend to feel more motivated when they are around people. Do your work in a coffee shop to get some social energy! ESPs need frequent breaks to get their energy out. Take little pauses in the middle of a big project to jog, do some jumping jacks, or walk around the block. Then come back refreshed and ready to continue. Remember that procrastinating isn’t always bad. Many times ESPS do their best work under pressure! INTPs and ISTPs are extremely autonomous individuals. They like having their own space and doing things without having to rely on a lot of other individuals. They tend to procrastinate about returning phone calls, attending social gatherings, or dealing with conversations that they know will be emotionally intense and involved. ISTPs, as sensors, tend to procrastinate dealing with long-term future planning. They’d rather be actively involved in accomplishing something NOW than focus on theoretical or hypothetical future scenarios. INTPs, as intuitives, procrastinate when it comes to dealing with issues in the here-and-now. They might get lost speculating about an idea or possibility and lose sight of an appointment they had in the present moment. As thinkers, both INTPs and ISTPs tend to dislike the “touchy-feely” aspects of life. Dealing with inter-personal tension or analyzing’s someone’s personal life can be frustrating to them. Remember that it takes at least 21 days to form a habit. Focus on doing one positive thing repeatedly for 21 days so that it becomes automatic. ENFJs and ESFJs have many differences between them, but one quality that they both share is a tendency to put other people’s needs before their own. They spend so much time analyzing the emotions and concerns of the people they love that they can lose themselves in the process. They tend to see things like “me-time” or relaxation as selfish or indulgent. They may struggle with saying “No” to requests from people and then wind up overwhelmed with a to-do list bursting with obligations. These types also tend to procrastinate about delivering bad news, giving criticism, or dealing with nitty-gritty analysis about impersonal subjects. Some EFJs like to deal with criticism quickly and just get it over with so that it’s not hanging over their shoulders. Others put it off indefinitely so that they can avoid the negative feelings that the situation will inevitably create. Get yourself an accountability partner to help motivate you and keep you on track. When you wake up in the morning try to knock out the three hardest tasks on your to-do list. That way you don’t have them weighing on you for the rest of the day. Remember that you won’t be able to reach your long-term goals if you are burned out and unhealthy. Make time for rest, relaxation, and healthy habits (this is especially important for ENFJs who tend to be less concerned with these things than ESFJs). Remember that you are a person who matters. You aren’t selfish for saying “No” to something you don’t have time for. ESTJs and ENTJs are extremely focused on productivity, achievement, and producing results. These types hate to dilly-dally when it comes to almost anything except managing their own emotions, feelings, and values. They can also fail to make time for the simpler pleasures in life because they’re so focused on getting things done (especially ENTJs). Because these types prefer the world of logic and empirical truth they can struggle when it comes to analyzing their own individual feelings about things. They feel like their emotions are unreliable and not worth giving credence to. This tendency tends to lessen as they reach their 50s and 60s because their inferior function, Introverted Feeling, tends to become more mature. Practice being present in the moment for at least fifteen minutes a day. Take in all the sights and sounds around you and find ways to appreciate those moments. Think of something leisurely and enjoyable you could do. Don’t constantly put off living life because you’re working. Before jumping right into a major decision, take a few moments to reflect on what’s really important to you on a personal level. Do you have any “gut” feelings about this decision that might be worth paying attention to? Try not to be “busy” every single minute of the day. Practice shutting off your phone and leaving it in your room when you’re with your family. Practice being present so you don’t miss out on important experiences. INFJs and INTJs get their biggest thrills from envisioning future possibilities and taking apart abstract concepts. They’re more likely to be interested in the underlying meaning of what’s happening rather than the concrete details. While this can be a good thing, INJs have a tendency to overdo it. They may become so focused on the future or finding a hidden meaning that they miss experiences happening right before their eyes. They can become blind to joys and simple pleasures because their heads are so filled with theoretical “what-if’s” and scenarios. Procrastination can also show up in their social lives. They run the risk of always having an excuse to not get together with the people they care about and wind up feeling lonely or unsupported as a result. As with all individuals, these tendencies are not the same across the board. 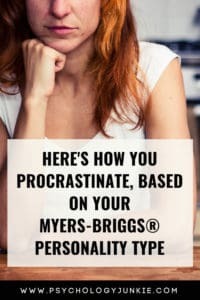 Some INFJs and INTJs may struggle with these forms of procrastination daily while others only experience them on rare occasions. Break large, overwhelming projects down into small chunks. Focus on the small steps needed to achieve the goal instead of getting overwhelmed by the immensity of the one goal itself. Done is better than perfect. INJs tend to be perfectionists and they can delay finishing something for long periods simply because they need it to match their internalized vision. Instead of deliberating or waiting for timing to be absolutely perfect just begin, even if you feel you’re not at your best. Find an accountability partner and talk over your goals with them. Use their encouragement to stay on track with your deadlines and goals. Don’t continually put off socializing. Getting alone time is essential for you, but you also need interaction with the outside world to be balanced. Introverts who balance alone time with occasional socializing function better, have more support, and are usually able to think more objectively. Don’t wait for inspiration every time you have a project or idea. As an intuitive you tend to want a “spark” of inspiration to get you started on something. Sometimes the inspiration happens while you’re doing the project, not before. Just begin and see where your ideas take you. ISFJs and ISTJs aren’t usually procrastinators, but they still can struggle with it if they feel like they don’t have enough information. They like to know all the details and facts and have a very clear, specific direction before they begin a project. If their knowledge base isn’t “adequately” filled or if they’re not familiar enough with where they are going then they can put off starting a project for a long time. This is especially true if they have a personal project or goal without a specific deadline. They tend to be motivated by deadlines and so if there isn’t one, or if the guidelines aren’t clear, they can get stuck not knowing how to begin or not being motivated to finish. Set a deadline and announce it to someone. While this doesn’t work for all types, for ISJs this tends to be beneficial. You tend to be more motivated when you have a deadline and accountability. If you feel stuck on the details of a project, schedule a day to research the details and get them in order so that you can begin. If you feel like you’ll get lost in these details, see if you can get a friend to help you stay focused on the big picture and where you want the project to go. A lot of ISJs tend to be perfectionists. Remember that nothing is absolutely perfect and getting it done provides its own rewards. Just do the best you can. Break large projects into bite-sized chunks. Check off each section as you go. Doing this will help you stay motivated and keep you from being overwhelmed. Read This Next: The Driving Force of Every Sensing Myers-Briggs® Personality Type. Was this article helpful to you? Do you agree or disagree with the information? Let us know in the comments! This was very interesting! I definitely agree with the ISTJ section, I tend to be a perfectionist and want all my questions answered before I begin a task. But I think I’ve actually become the opposite of my stereotype because I kind of procrastinate on everything?? Maybe it’s just because of where I am in life, or feeling overwhelmed and exhausted, but I don’t really put effort into my classes or work unless I’m deeply passionate about them, or there’s some kind of reward. I tend to just do my own thing until the deadline is right in front of my face. And even then, I’m often late. 😀 I guess I don’t have the motivation or discipline. I’m sure other ISTJ’s can relate, we’re plagued by both our sense of duty and our strong desire to just do nothing and sleep. I love your articles! They always make me laugh because they are spot on for me. Of the family/friends whose MBTI I know, they were all perfectly represented. My forever marriage problem is the fact that I’m an INFP, my husband an ESFP… I’m told to get alone time, he’s told to do projects with people. Lol! It’s been an issue for years. This article was very timely, I’m an INFP procrastinating right now and trying to figure out a way to get what I have to do done without feeling like I’ll mess up. It involves socializing so I know it’ll take me a while because it’s very hard for me. This was great advice, especially what you said about getting a TJ to help schedule your tasks. My best friend is ISTJ and she made a very good shedule for me once when I needed it before a week full of exams for which I hadn’t studied as much as I should. I passed all of them in no small part thanks to her.